Reward Offered for ‘Red Line Robber’ Reviewed by Edgeville Buzz on March 21, 2009 . 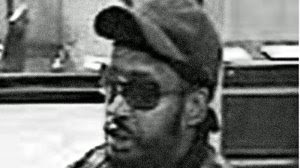 The FBI is offering up to $10K for information leading to the arrest of a serial bank robber who is believed to be responsible for holding up 6 Chicago banks, inlcuding the North Community bank branch at 5342 N Broadway (1/23/09) & the MB Financial at 6443 N Sheridan (3/10/09), both in Edgewater. The suspect, considered armed and dangerous, has been described by witnesses as a black male, 30 to 35, 6 feet to 6-foot-2 and 200 pounds with a medium build and beard. He has worn sunglasses, a dark colored baseball cap and a black bomber jacket during all of his robberies, according to a release from the Chicago FBI.